In Tim Burton's Batman, Jack Nicholson's Joker famously wondered "where does he get those wonderful toys?" We can only imagine what that Joker would say if he saw the actual toys inspired by the Dark Knight. There have been many fantastic Batman toys over the last eight decades, but a custom LEGO builder may have just outdone all of them. Via The Brothers Brick, Brent Waller has unveiled his massive LEGO Batman Wayne Manor and Batcave that stands over six feet tall and is comprised of over 100,000 LEGOs. Waller's design for both Stately Wayne Manor and the Batcave takes its inspiration from several chapters in Batman's long history. Although it is primarily populated by The LEGO Batman Movie figures. There are even a few hilarious side scenes, including Alfred performing a little Bat-laundry outside the mansion. You may notice a few cameo figures from LEGO Dimensions in this build, including Stripe from Gremlins riding a dinosaur. In the picture below, Harry Potter is climbing a ladder with Green Lantern close behind him. Below, you can see Batgirl in the armory, the Batcave's central command computer, and a working carousel of Batman costumes. Scooby-Doo and Shaggy are apparently getting a tour from Robin. Many of the side rooms put the spotlight on the upper tier Batman villains including Two-Face, Poison Ivy, Mr. Freeze, and of course, the Joker and Harley Quinn. One of the more impressive touches is the Lazarus Pit room that depicts the resurrection of the second Robin, Jason Todd. Waller's incredible LEGO skills are only rivaled by his sense of design; this is such a masterfully conceived build that it's practically perfect. His skills are far from unknown among LEGO builders, however, as he designed the LEGO Ideas Ghostbusters Ecto 1, and built LEGO Batmobiles that were used in the production of The LEGO Batman Movie. 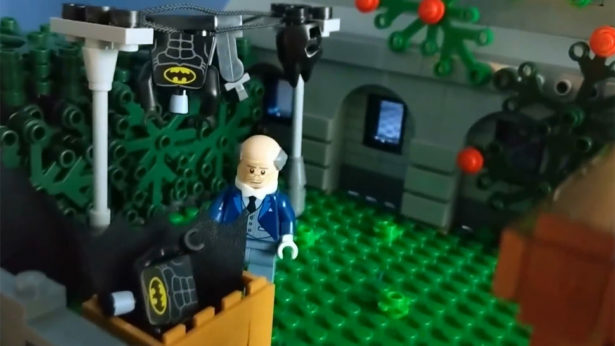 For a more complete view of the LEGO Wayne Manor and Batcave, you can watch Waller's nearly six minute overview below. You can also find more of his creations on his Flickr page. What do you think about the LEGO Batman Wayne Manor and Batcave? Let us know in the comment section below! Kingdom Hearts toys now include Tron and Sark. Preview Dark Horse Comics' Zelda encyclopedia. MTV to try live-action Aeon Flux again.